DVTk applications work by validating DICOM objects using a set of definition files that specify the different Information Object Definitions of the DICOM standard. However, the definition files provided along with DVTk, have not had an update for over 7 years. A crowdfunding initiative was started last year in order to fund the update of the definition files. Unfortunately this did not result in any backers. ICT Group therefore decided to invest time and effort updating the definition files and making them available for a small fee. A dedicated software developer was allocated for this meticulous job and the good news is: The updated DVTk definition files for the 2018a standard are now available! Although ICT Group is asking a small contribution fee per company for the updated definition files, any revenue will be re-invested in the DVTk open source project. So, if you would like to use these latest definition files, then acquire them and support the DVTk project in the process! 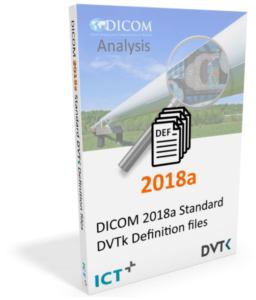 Click here for more information on the DICOM 2018 standard DVTk definition files.